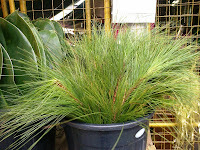 It is More Fun Going and Growing Natives! I spent the last week dividing my time for Metro Home mag and the Flora Filipina show. We already finished putting up the PNPCSI booth for Flora. For Metro Home I am down to writing my last article for the next issue. Barely surfaced out of writing chores to enjoy the Flora Filipina exhibits. Will write about the booths next time. The Flora Filipina's theme is 'Gardening is more fun in the Philippines' riding on the current slogan of the Dept. of Tourism. The PNPCSI answered with a booth tackling 'It is more fun gardening with native plants in the Philippines'. The rest of the display booths designed different geographical regions in the Philippines. The PNPCSI booth simply came up with a landscape using all native plants. It is probably not the prettiest booth in the expo but it was indeed fun and exciting for me to design and implement the display. Hope you would get to see it while the Flora Filipina is open, till March 12. To the Philippine Orchid Society, PNPCSI members and Jardin Isabel, thank you for making the booth possible! I just found out that my Dangwa find dugo-dugoan is actually called plainly duguan. Bonifacio Passion said it is a nutmeg, probably Myristica philippinensis. Rojo's 'Lexicon of Philippine Trees' indeed state that duguan is M. philippinensis. The fruits have almost all opened up revealing the reddish aril (which may be the reason why it is called duguan or 'bloody') and the large seed. Have planted most of it in a common pot. Hope they will germinate unlike the Knema glomerata seeds I picked up in Laguna. After talking about Hoyas, I remembered 1784, Alex Paglinawan's Lipa getaway. Last December we went there for a Metro Home feature on the farm. Alex showed us his flowering Hoya multiflora. It was the season's first blooming Hoya for me, but technically it did so in 2011 hehehe. But the flowers are still equally interesting. I love what Alex did to his place. It was rustic and provincial, very rural in appeal. It was the perfect escape from the stress of the very busy and congested city. For us it was a relaxing work as we had to do the shoot the day after Christmas. It did not feel like working at all especially because of the warm welcome Alex extended to us, not to mention the unforgettable lunch experience under the mango tree. You could read more about 1784 in the next Metro Home issue which will be out this weekend. Dining under the mango tree! To Alex Paglinawan, a very big thank you from the Metro Home team! Quick Post: I have forgotten I have 2 specimens of Hoya buotii, which all are planted at an obscure area in my garden. Maybe just to remind me that it was still there, the plants brought out their pale yellow and pinkish star clusters. It is pleasant to get reacquainted with you, Hoya buotii. I will repot you my old friend. Another old friend but long gone in my garden is Hoya meliflua. I saw this flowering specimen in the Centris market and remembered how lovely they are. But I feel bad because I can't afford the time to get one. When I am ready to resume Hoya growing, I will find the place and time to reestablish my Hoya collection, to know new things about these beautiful Philippine natives. Walking this afternoon and was mortified to stumble into this scene - probably thousands and thousands of Swietenia or mahogany seeds being sun-dried. I do not know what these are to be used for but I could only speculate that they would either be packaged and sold, or planted to become seedlings. And when they do, where on earth would they end up? Not in America where they are native. Most likely the nearest reforestation project where they would need saplings to plant. Maybe why I see more and more artificial forests of mahogany in the Philippines. As a last minute errand, I went to PRC at the final hour of the working week to renew my architect's license. Surprisingly if you have the proper requirements, it won't take you longer than 15 minutes to finish application. But there is a waiting time of more than a month to claim the license ID card. So I will be making my journey back to Morayta this March. Since the Friday traffic is as expected - heavy as always, I decided to walk the perimeter of University of Sto. Tomas to reach Joli's and Dangwa. The stroll from PRC to Lacson was not bad at all! Probably the only hassle was I had to climb up the pedestrian overpass to get to UST's side. When I got to Joli's, I made a quick splurge on a pencil holder. 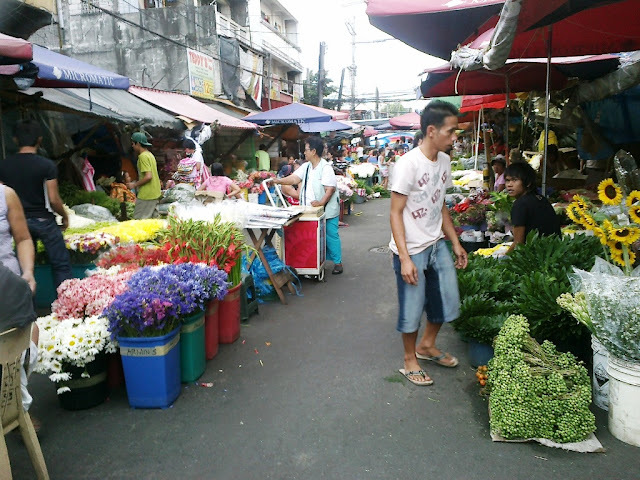 Some minutes later, I was striding a few more blocks of Lacson Avenue to get to flower haven, Dangwa. 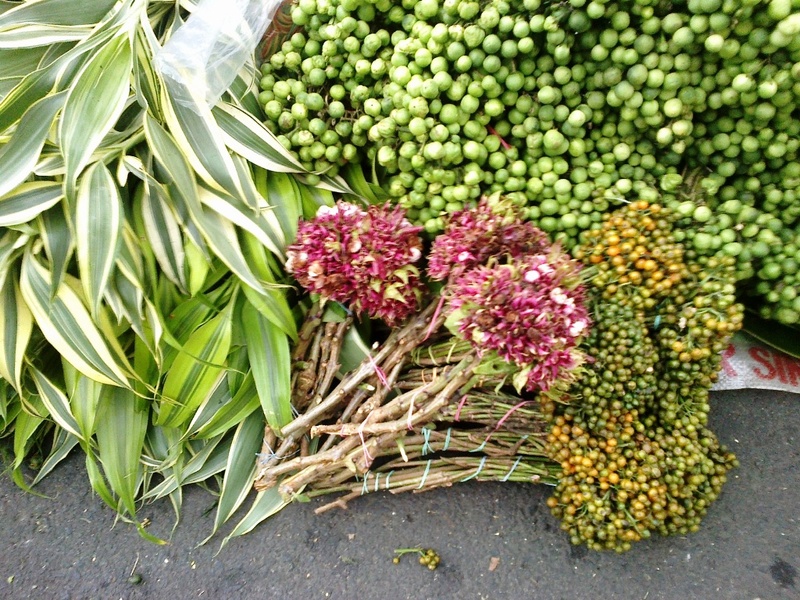 I occasionally go to Dangwa whenever I am asked to arrange flowers for friends. But often, I go there to scout for potential planting material. It is rare that I go home empty handed and today is no exception. 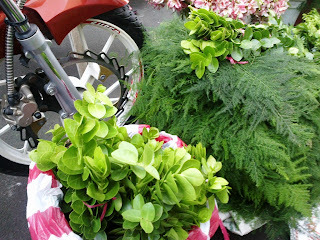 My eye caught some items which I seldom see sold as cut flower. Some natives spotted were Hoya cumingiana sprays, pandakaki fruits (Tabernaemontana pandacaqui), Pinus kesiya leaves, and an unknown fruit, coming from tree called dugu-dugo. I have no idea what a dugu-dugo tree is or how it looks like. The seller was describing it as a popular tree in his hometown in Laguna. I was intrigued which is why i got persuaded to buy a bundle. It may be that what I bought is not native or worst something familiar like maybe sineguelas. I just gave the seller the benefit of the doubt. 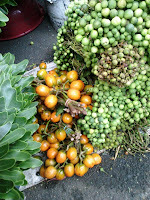 But along with the dugu-dugo fruits I purchased a bunch of pandakaki fruits and the Hoya sprays. I made it home before dark and had time only to plant the Hoya as cutting propagation in the garden. I will scrutinize the other items in the morning when there is daylight. The pictures posted were taken using my hand phone. I was not armed with a proper camera when I went there so please dispense with the blurred shots. The streets of Banawe are marked red! The evidence is clear that the people in Ifugao province still chew moma or betel nut. For one, immediately after going down the bus in Banawe town, you will find the street pavement heavily stained with reddish color. Others might get frightened and mistake them for blood stain, but these are moma stains spat by the local people. In the Mountain provinces, moma is chewed not only by the elders but also by younger people. They liken the sensation and the addiction to cigarette smoking. 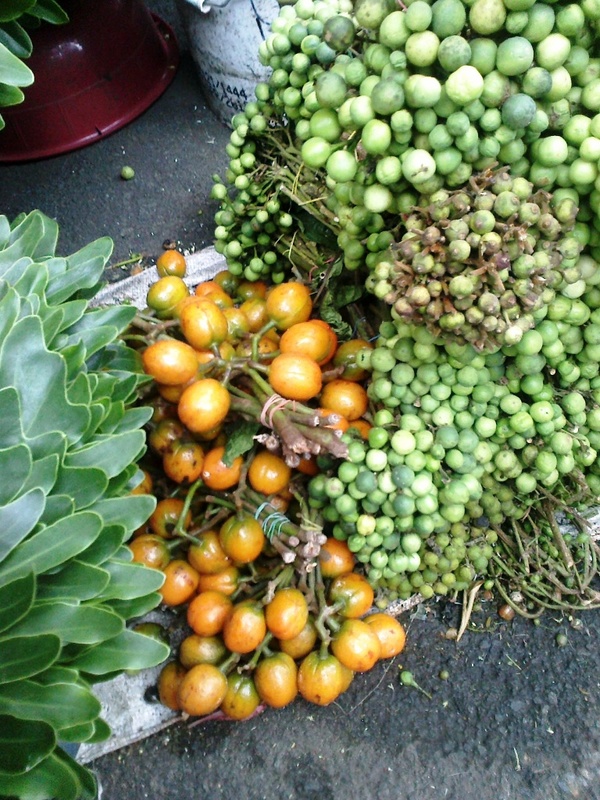 Moma in Ifugao is the basic betel nut mix of nganga (Areca cathecu) nut, piper leaves (Piper betel) and apog (lime). Another relic found as evidence are traditional wood carvings used to contain the white lime. I found a piece carved out of white alnus, which is an introduced lumber species from Japan. But luckily I spotted a few made out of kamagong and some native hard woods. Even this art is a dying breed. These carved lime containers are slowly being replaced by lighter plastic containers. The wood carved ones might become scarce like the different native wood which they use to carve these items from. But the most obvious is the presence of the betel nut palm or nganga growing abundantly in and around Banawe town proper and Batad. 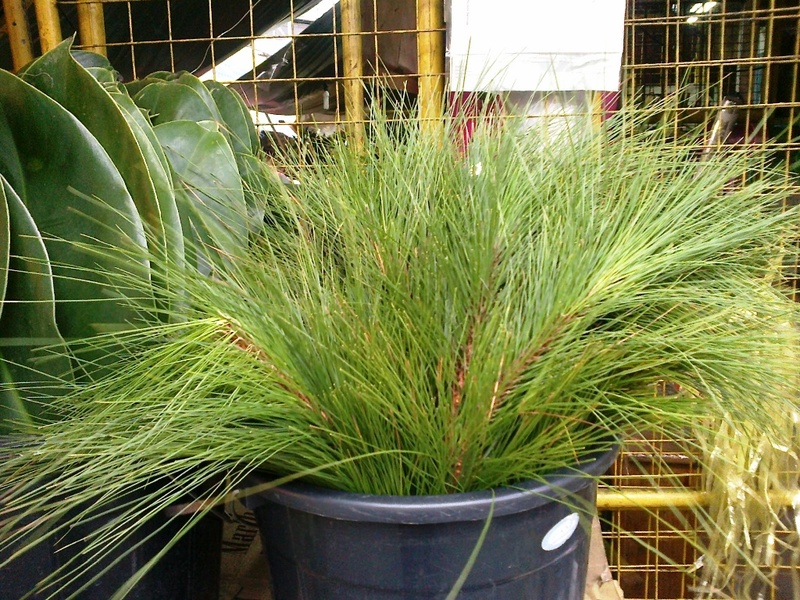 The slender palm is a very attractive species to grow solitary or in a small clump. 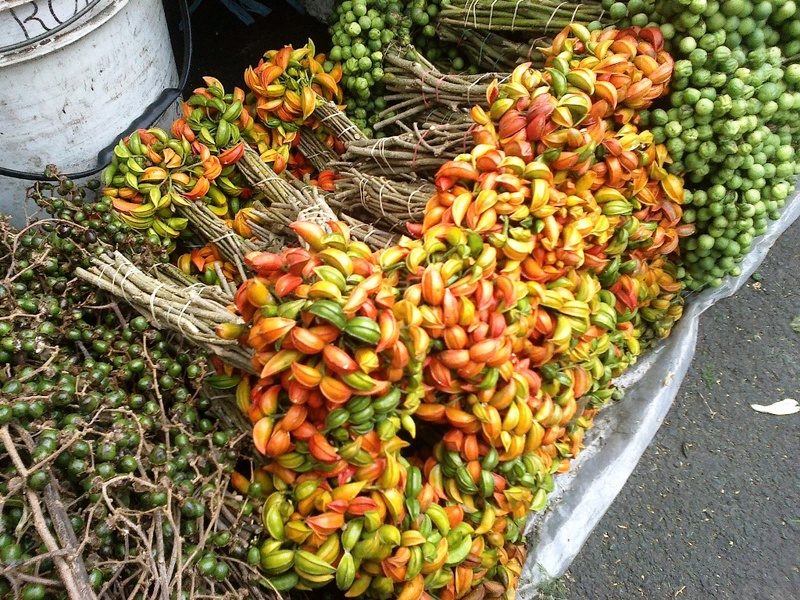 It is a predictable plant to see especially in communities which still have a strong culture of betel nut chewing. The culture of moma is alive and well in the mountain provinces!